Dropped catches and sloppy ground fielding cost West Indies a magnificent win in the third and final Test against India at Wankhede Stadium, Mumbai, on November 26, 2011, which was the last day of the match. It was a horrible day for batsmen as 17 wickets fell and the bowlers from both sides dominated throughout the day. West Indies scored 590 runs in their first innings and India replied with 482 runs which gave visitors a useful lead of 108 runs. The Carribeans were placed well at the close of the fourth day’s play at 81 for the loss of two wickets and had earned an overall lead of 189 runs with eight wickets still in tact. Kraigg Brathwaite and Darren Bravo started the proceedings of the day as they were unbeaten on 34 and 27 runs respectively. The duo added ten runs in the overnight total before Brathwaite was caught at point by Sachin Tendulkar off Ojha for 35 runs. The third wicket fell at 91 runs when Kieran Powell walked in to take his turn for the second tine during the match. 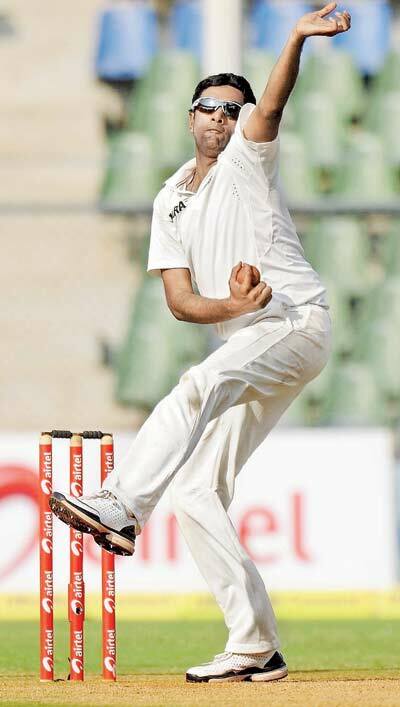 Aaron was replaced in the 44th over by off spinner Ravichandran Ashwin and it was all spin operation from both sides. Bravo lost his wicket after scoring 48 runs once he was caught and bowled by none other than Ojha again. The fourth and important wicket of Bravo was gone at 112 runs and the West Indians were in deep trouble. Indian spinners took total control of the game and ripped through the batting line up of the visitors. The wholeWest Indiesteam was restricted to 134 runs before they were bowled out in 57.2 overs. Ojha destroyed the rival batting line up by grabbing six wickets for 47 runs and Ashwin was unplayable at the other end while claiming four wickets. India was set to chase a target of 243 runs to win the match and that was very much likely keeping in view their strong batting line up. Indian lost their first wicket quickly as Gautam Gambhir was gone after scoring 12 runs. The ever determined Rahul Dravid joined in next with fluent going Virender Sehwag at the other end. The seasoned opener got a lucky escape when he was dropped by Darren Sammy off Marlon Samuels on 27 runs. He lost his wicket on the first ball of the next over from Bishoo caught by Sammy on 60 runs. Tendulkar had a miserable innings and was the next batsman to leave the crease after scoring just three runs and India was 106 for three at that moment and the target looked achievable for them. The worries started for them when Dravid lost his wicket after the addition of just seven runs in the total. The match looked wide open for both sides as VVS Laxman occupied the crease and joined with Virat Kohli. The duo shared 52 runs partnership but Laxman lost his wicket at his individual score of 31 runs. Kohli went back to the pavilion after playing a solid knock of 63 runs. He was the seventh batsman to be dismissed at 224 runs andIndiarequired 19 runs andWest Indiesthree wickets to win the game. The Carribeans were under tremendous pressure and missed few run out chances but still were in the game. Indiawas in search of three runs for the victory in the last over of the day and two wickets could have given Windies the much deserved victory. Final over was bowled by Fidel Edwards who showed perfection and gave away just two runs and the thrilling match was drawn. Ravi Rampaul was the highest wicket taker, Samuels and Bishoo shared two wickets each as Edwards got one. India won the three Test series 2-0, Ashwin was declared ‘Man of the match and the man of the series’ for his excellent performance.